We surveyed companies to find out why they attended last month’s Destination Growth conference at IWM Duxford. 56% wanted to find solutions to changing customer buying patterns, 44% to find ways to overcome pricing sensitivity, nearly 24% to find ways around shorter sales lead times and 20% to ‘Add Value’ for customers. The survey mirrors what we have been finding for some time now. To succeed, businesses need to look creatively at ways to build loyalty, market these initiatives to their customers and train their staff to embrace the changes required to use them to best effect. Destination Growth ‘09 was very well received with 74% of those surveyed saying that the event either met or exceeded their expectations. Over 37% of attendees claimed that they took away three or more ‘Business Nuggets’ that provided insight to help them build their businesses. To encourage delegates to enter the survey there was a prize draw to win a copy of Destination Growth’s keynote speaker Greg Dyke’s book, Inside Story. 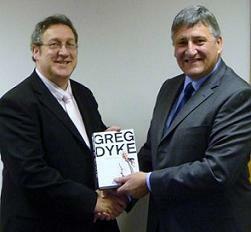 The lucky winner was Roy Badcock (left) from Cambridge Building Society, receiving his prize from Jonathan Wainwright (right). The Cambridge Building Society is an independent, mutual organisation which has been operating in Cambridge since 1850. The head office and branches are all within a 20-mile radius of Cambridge. The Society has over 120,000 local members and assets exceeding £844 million. A full copy of the survey is available from FCG Consultancy in Ely by contacting Jonathan Wainwright on 07971 006 446 or emailing jonathan@fcgconsultancy.co.uk. This entry was posted on Monday, December 7th, 2009 at 12:28 pm and is filed under destgrowth, Marketing. You can follow any responses to this entry through the RSS 2.0 feed. You can leave a response, or trackback from your own site.